DJG is among a select group of artists that can claim responsibility for the explosion of dubstep in San Francisco, and he did it while pushing the sounds of drum & bass under his alterego Genome. Lately a pair of releases from DJG have come out: grade-A dubstep on a Headhunter collboration, and some cutting edge autonomic drumnbass sounds. All 5 tracks here are masterful productions: spacious, bass heavy music with absolute quality percussion. Up first is the latest on N-Type’s label Wheel & Deal, and trust these two are worthy of the label name. With support from a legion of DJs, these tunes have been rumbling dancefloors around the world. The a-side “Pressure” begins with droning vocals that remind me of Tuvan throat singing. Bassline murderation then ensues with a mutant halftime feel on the percussion that, combined with the droning vocals, produces a surreal soundscape. Prime time audio here. On the flip, Headhunter aka Addison Groove joins up for “Space Cakes“. Munch one of these and head for outer space on a tune with alien synth stabs, odd voices, and of course huge bassweight. Two for two on this one. Next I’d like to change the pace and change the style with the latest on Warm Communications, a drumnbass label based in Texas. These three showcase an exciting new “autonomic” sound in dnb coming from the likes of dBridge, Instra:mental, Vaccine, ASC, Spectra Soul and more. The sound is driven by rolling basslines, strong use of atmospherics and substantially less percussion than you’ll find in most dnb. Amens are notably lacking. First up is “Hydrate“, the foundation of the 3-track EP with a lush bassline holding down the foundation under somewhat erratic yet danceable percussion. Sparse vocal samples and chirps keep things rolling. Next, Consequence steps up on remix duties adding what I can only describe as microkicks to drive the beat and keeping choice elements of the original. Look out for the breakdown & build into the second half, dangerous. Redone by DJG in a dubwise style, “Hydration Dub” closes out the release and is my favorite of the three. The bassline changes up to sound a bit more like Robbie Shakespeare in the studio with echoes on the percussion that would make Scientist grin. Three for three. Respect due. For more visit his Blog, Twitter, or Soundcloud. Description: Day party with BBQ and beats at the Oasis, two rooms with everything from dubstep to dnb to funky house and all sorts in between. 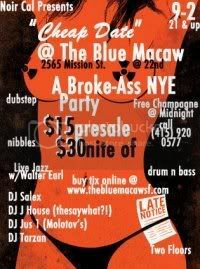 Description: NYE party here from all sorts of musical styles from live jazz to dubstep to drumnbass and more. Tickets: $15 presale, $30 door. Description: Slayers Club is responsible for the popular, cutting-edge weekly “Terenga – Global Bass Sessions” at Little Baobab (“The best weekly in San Francisco” -Kid Kameleon/XLR8R Magazine, Surya Dub).